Apartamento Via Augusta 153 offers stylish 1-bedroom apartments with free Wi-Fi, air conditioning and a flat-screen TV. It is located 100 metres from Muntaner FGC Metro Station, in Barcelona's upmarket Sarrià-San Gervasi district. Each Via Augusta Apartment features modern minimalist décor and wooden floors. Apartments have a spacious living-dining room with a sofa bed and a kitchen with an oven, coffee machine, dishwasher and washing machine. Please note that check-in after 21:00 carries a surcharge of € 30. 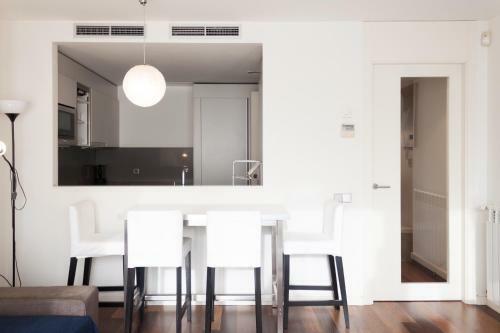 This stylish air-conditioned apartment features modern minimalist décor and wooden floors. It has 1 double bedroom and a spacious living-dining room with a sofa bed and flat-screen TV. The bathroom includes a hairdryer and free toiletries, while the kitchen offers an oven, coffee machine, dishwasher and washing machine. Free Wi-Fi is also included. Rate: € 114.30 ... € 225.00; select dates below to get current rates.